14k Yellow Gold Rosary 3 mm Beads virgin Mary crucifix Jesus Cross Necklace 26"
Real 14k Three tone white, rose and yellow gold rosary with crucifix Jesus and oval virgin mary and Jesus crucifix cross pendant. 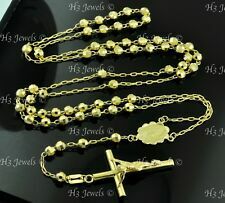 Order your beautiful 14k gold rosary. Virgin mary oval pendant 11 mm long. 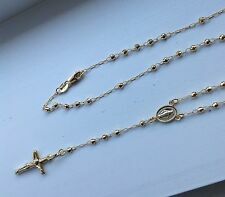 Theme: ReligiousLength: 24 - 29.99"
3.00MM14K SOLID GOLD ROSARY NECKLACE CRUCIFIC/VIRGIN MARY 16" 18" 20" & 24"
14k Yellow gold Rosary chain necklace. Gold : 14k. Weight : 5.80 grams. All gold are 100% genuine. Not plated. $Welcome to Gold & Diamond Exchange [Our Store] (https://www.ebay.com/usr/goldanddiamondexchange?rt=nc) [Feedback] (https://feedback.ebay.com/ws/eBayISAPI.dll?ViewFeedback2&userid=goldanddiamondexchange&ftab=AllFeedback&myworld=true&rt=nc) [Other Items] (https://www.ebay.com/sch/m.html?_nkw=&_armrs=1&_ipg=&_from=&_ssn=goldanddiamondexchange&_sac=1#seeAllAnchorLink) 14k Solid Tri Color Yellow Gold Rosary Beads Virgin Mary Cross Necklace 20 in Item Details: Metal Purity: 14k Solid Tri-Color Gold Style: Chain Length (inches): 20 inches Width of Bracelet (mm): 2.0mm Theme: Religious Clasp Style Spring Ring Total Gram Weight: 3.0g Brand: GM Made in: Mexico This gorgeous gold neckalce will make a great addition to your fine jewelry collection. 14K Yellow Gold Necklace with Gem Stones, Rosary, 26 Grams, 24.5 Length. Claw hook can be moved to various positions to achieve desired neck and drop-down positions when worn as a necklace. Condition is Pre-owned. 14k Yellow gold long diamond cut bead chain Rosary Guadalupe necklace. There is no diamond on the chain, just diamond cut. Gold : 14k. All gold are 100% genuine. Not plated. This rosary is made with solid 14k gold. The approximate weight of the necklace is 4.8grams. The beads are faceted cut and are 2.5mm in thickness. It has a solid crucifix (1" in length) and a virgin Mary (Guadalupe charm). This beautiful Virgin Guadalupe Rosary Necklace is carefully crafted in solid yellow gold. Rosary Moon cut Ball Beads. 14k Yellow Gold. Spring Ring Clasp. Chain Type. While we will continue to make every attempt to avoid such errors, they may still occur. Faceted Diamond Cut Disco ball shape polished beads 3mm in thickness. 14K GOLD, REAL GOLD. Stamped 14K for Authenticity. Yellow Gold. This item is not gold plated, not gold filled. Cross length. 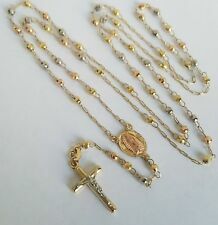 Solid real 14k Three tone white, rose and yellow gold baby rosary with crucifix Jesus and virgin mary. Order your beautiful 14k gold rosary. Virgin mary oval pendant 14 mm long. 14k stamped on the lock/safe and secure lock. Solid 14k Yellow Gold Tri-Tone 3mm Beaded Rosary Cross Diamond Cut Necklace weights around 7 grams. ( length 18 inches) Condition is Pre-owned. Shipped with USPS First Class Package. Payment must be submitted within 24 hours please. Theme: ReligiousLength: 18 - 19.99"
24” Rosary Beads. 14k Gold 5x electroplated over Sterling Silver. 100% Solid Silver will never turn your hands or neck green! Bracelet & Chain Sets. 925 Silver Jewelry. 6mm beads (hollow). Handmade in Italy. This rosary is made with solid 14k yellow gold. The approximate weight for this necklace is 7.7 grams. The beads are faceted cut and are 3.00mm in thickness. It has a solid crucifix (1" in length) and a virgin Mary (Guadalupe charm). 14K Tri Color Gold 26" Beads Lady of Guadalupe Rosary Necklace Crucifix 6.2 g. New14K Tri Color Gold 26" Beads Lady of Guadalupe Rosary Necklace with Crucifix. Approximate Weight - 6.2 grams. We are proud of the joy and happiness we have provided thus far and hope to provide even more. 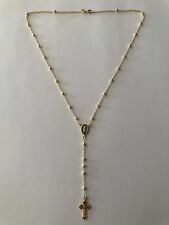 14k Yellow Gold Rosary Beads Necklace 18" Virgin Mary Jesus Cross w/ Yellow Gold and I believe White Gold or Silver Beads/Balls. Clasp Type. Lobster Claw Clasp. Polished, Diamond Cut, FACETED. Moon shape Diamond Cut ball shape polished beads 3mm in thickness. 14K GOLD, REAL GOLD. Stamped 14K for Authenticity. This item is not gold plated, not gold filled. White Gold. Cross length. Exprese su fe con la belleza de este rosario único con tres tonos de oro macizo de 14k de cuentas, la Virgen de Guadalupe, y desciende a una cruz del crucifijo de Jesús. Oro Bonito. La joyeria de oro solido es la mas alta en pureza. 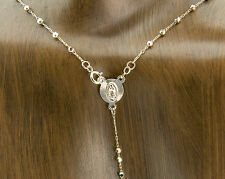 Beautiful Real 14k Yellow Rose and White Gold Rosary Necklace. We have to magnify photos to show details. This is not gold plated, not gold electroplated, or not gold filled. This is real gold. Length: 24" 4.5" drop. Made With Real Solid 14k Gold. Based in the Los Angeles Jewelry District. Our goods are manufactured and imported from the best Italian jewelry factories. About Gold N Chains (GNC) Solid Carefully Crafted Chain. This rosary is made with solid 14k Yellow gold. The approximate weight for this necklace is 25.3 grams. The beads are faceted cut and are 6.00mm in thickness. It has a solid crucifix (1.5" in length) and a virgin Mary (Guadalupe charm). This beautiful three tone Virgin Guadalupe Rosary Necklace is carefully crafted in solid yellow, rose and white gold. Rosary Three Tone Diamond Cut Ball Beads. 14k Yellow Gold. Diamond Cut. Chain Type. A unique and beautiful design, this religious necklace is a lovely outward display of inward faith. Fashioned in 14-karat yellow gold, this necklace features charms, beads and a cross. Gender:Ladies'. 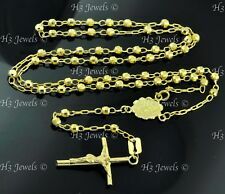 New ListingBeaded 14k Yellow Gold Rosary Cross Necklace 24"
Keep it close to your heart and have faith in the details. Crafted in 14k yellow gold, the 24" strand makes a fine addition to your jewel box as well as your wardrobe.60860. 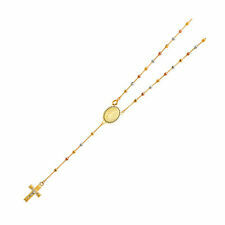 Beaded Rosary Cross Necklace in 14k Yellow Gold 24". 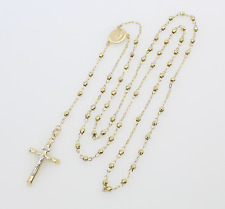 Tri Gold 14k Solid Gold Rosario Rosary. Beads Virgin Mary Guadalupe Necklace. Technibond jewelry is crafted from. 925 sterling silver with a 40-mils-thick outside layer of 14K yellow gold. None, not needed. 35.10 grams. • Stamp: 14K. • Chain Length: 18”. • Stamp: 14K. • Chain Length: 17” 1" Extender. Type: Rosary Necklace. High polished diamond cut bead finish gives this necklace a stunning shiny look that lasts for many years. All pictures you see are authentic and were shot by us. Stamped: 14K. Fabulous 14k yellow gold Rosary Beads necklace! • Total length including virgin Mary and cross is 24". This necklace is pure 14k gold and it's not plated. • Cross hangs 3 " long from virgin Mary. • Weight of the necklace is 6.80 grams. 14K Yellow,White & Tri Color Gold 4 mm Beads Rosary Necklace Rosario 24"
For sale is a beautiful 14K Real Tri Color Gold Rosary Necklace Chain 20" long. The rosary is in great condition, with yellow, white, rose gold beads. Total weight of 5.6 grams. This rosary is made with solid 14k gold. The weight of the necklace is 7.4grams. The beads are faceted cut and are 3mm in thickness. It has a solid crucifix (2cm length) and a virgin Mary (Guadalupe charm). 14K TRICOLOR GOLD ROSARY NECKLACE 4.0mm beads/crucifix & Virgin Mary 24"
This rosary is made with solid 14k Tricolor gold. The approximate weight for this necklace is 13.6 grams. The beads are faceted cut and are 4.00mm in thickness. It has a solid crucifix (1.5" in length) and a virgin Mary (Guadalupe charm). The Rosary weighs 13.9 grams. This is to protect both parties. work to resolve. Spring Ring Clasp. Clasp Type. Polished, Diamond Cut, FACETED. WE HAVE A STRONG KNOWLEDGE IN ESTATE SILVER AND ESTATE JEWELRY. WE DESCRIBE EVERYTHING TO THE BEST OF OUR KNOWLEDGE. ITEM HALLMARKS. ITEM CONDITION. ITEM SIZE & WEIGHT. 14K Tri Color Gold Rosario,Rosary Beads Virgin Mary Guadalupe Cross Necklace 32"
Very beautiful 14K solid gold Rosario Rosary beads Virgin Mary Guadalupe cross necklace. Beads ( Cross ) size appx: 1.5 mm. Length without dangling part appx: 27", including dangling part: 32". Weight: 20.2 grams. This rosary is made with solid 14k gold. The approximate weight of the 18" necklace is 4.8grams. The beads are faceted cut and are 2.5mm in thickness. It has a solid crucifix (1" in length) and a virgin Mary (Guadalupe charm). Polished, Moon Cut. Clasp-Free, none needed. AAA quality CZ, Zirconia. 41.00 grams. 14k Polished 16in Cross Rosary Necklace. At Lane Jewelers, our goal is for you to find jewelry that you'll both treasure and love wearing. 2.5MM 14K TRICOLOR GOLD ROSARY NECKLACE CRUCIFIC/VIRGIN MARY 16" 18" & 20"
14K Solid Real Tri Color Gold 2.5mm Ball Rosary Necklace - 20"
14K Solid Real White Gold 2.5mm Beads Ball Rosary Necklace - 20"